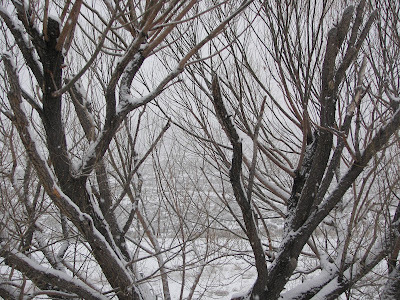 All year long I have been complaining commenting on the fact that we haven't received any snow; I have missed the snow and then......here's what we got over the weekend. 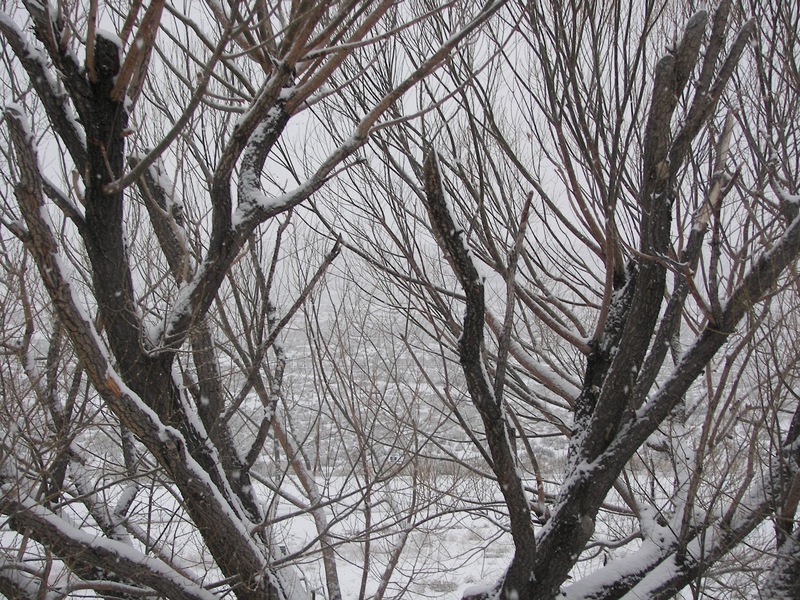 Finally snow --- when I am thinking about Spring! 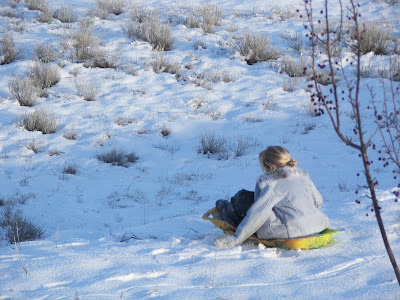 Talley, our youngest, sledding down our little hill. I have four of these lovely plates and matching teacups, saucers, and a teapot. I love the color yellow on a table, how about you? My world through a "bubble glass" view. There aren't too many things that beckon to you more than a tall cake on a cake pedestal. It calls saying to you, "You really want to cut into me and take a piece." 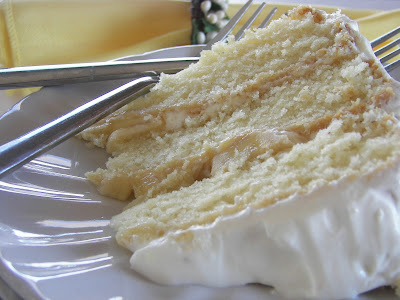 It called and I listened -- a cut piece of cake. This is a adaptation of a cake that my Aunt Mary, mother of 10, used to make on her children's birthday. She made her layers in pink, white, and green. I always loved going to her home to celebrate birthdays. Today, mine is just white. What a pretty post for a snowy day. You've made me wish to make a cake - I think mine will be lemon. LOVE those dishes! and topped off with one of your fabulous cakes...AHHH!!! to Die For! Snow this close to spring is FUN!!! Enjoy it! Looks like Talley is LOVIN IT! Joni, This pretty table has a bistro feel. Oh, how I wish I was sitting outside in a bistro on a warm spring day!!!! Very, very pretty! Don't you just love bubble glasses? I use mine all the time. And yellow decor IS my very favorite. I have a love affair with butter yellow! That cake looks scrumptious! Where, Oh where is the recipe? Cleansing snow and Spring just go together Joni! 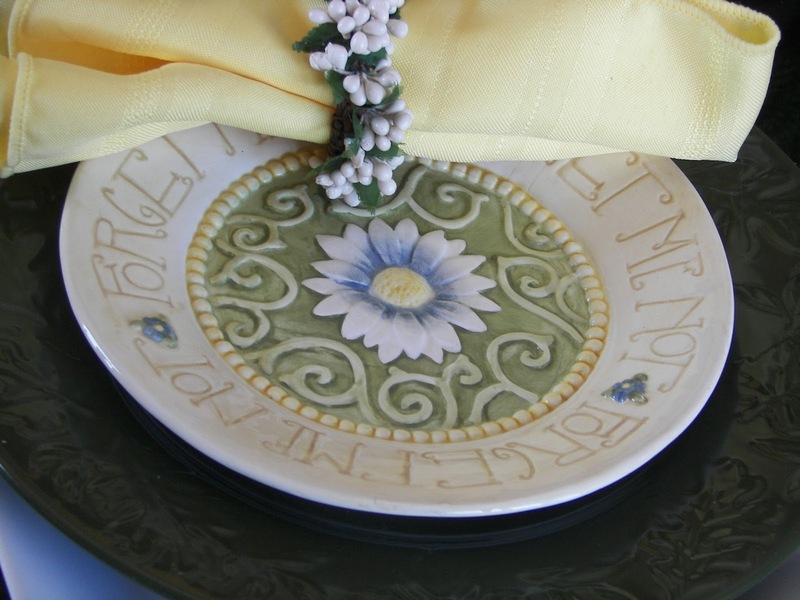 I'm adoring your sweet forget me not plates and would enjoy just one delicious bite of that luscious tall cake. I always appreciate your pretty thought-out scapes. I do so love yellow on the table too. so cheery and welcoming. 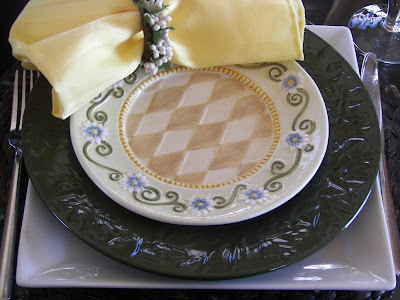 Your plates are darling, and they do remind me of spring.. wistfully have me wishing for it to arrive. The cake looks amazing, wow. Great table. Love the table. Such cute plates. As for the snow, we are tired of it up here in Chicago. Bring on spring. Pretty table and really cute dishes! Your cake looks yummy too! Oh yes, those plates do sing of spring...lovely table. I have always like a 3-layer cake...looks delicious. 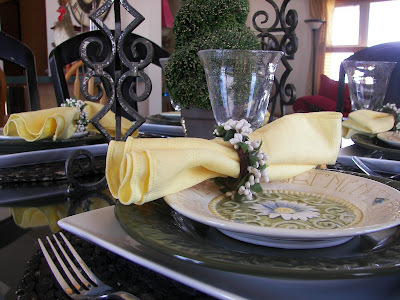 I love the layering in your place settings...very pretty! and that cake looks heavenly! Just lovely! I like the colour combo you've used and the yellow does make one think Spring even when there's snow outside! 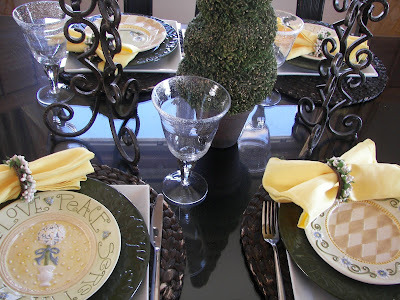 Love the candlesticks and that topiary makes a wonderful centerpiece! Yummy looking cake! Pretty table and that cake looks scrumptious! Love the bubble glasses. Beautiful table, I'd love to sit down for a piece of cake. I'm standing right there with you about the color yellow on the table. It always looks wonderful to me, and this table is no exception. I love your forget-me-not rimmed plates to go along with the springtime feeling. Your table made me smile. I also wanted to tell you that I continue to remember your family and hope you all, espcially your sister, are full of the joy of that hope. Oh, those plates are just delightful! I love the whole feel of this table. I love forget-me-nots. I think it is the name as much as anything. If you care to share that recipe, I would love to have it. I have never made such a pretty cake! It is so inviting. How pretty...I like the idea of the topiary on the table, I may use that one of these days! I love the soft colors and that cake looks delicious! Very pretty table. The yellow napkins just pop! Your cake is amazing...looks delicious! I love the plates! So pretty and springy! The plates are so pretty! 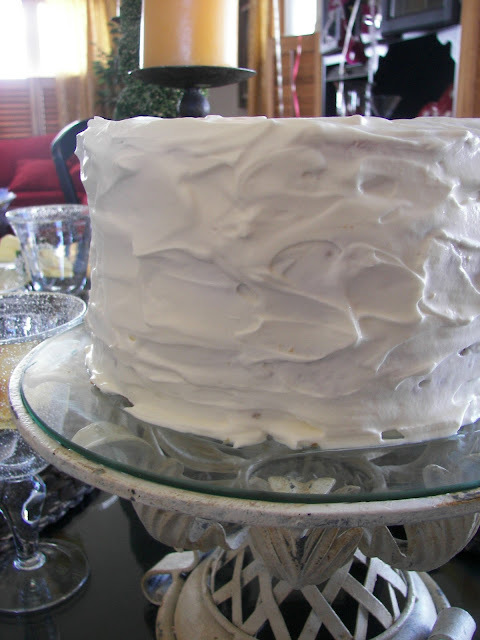 Your cake looks terrific, you made me want to bake something, so I did, a Lemon-meringue Pie, so now that I did and it came out pretty good, I'm commenting on your table. I had my mom for lunch as it's our 36th. Anniversary and my hubby gave a Czech Rep. THUM set of dishes for 8 in the Onion pattern, blue and white...sooo very thrilled, I will make a post for Monday. Thank you for sharing, I'm also your newest follower, hope you visit me too, you're very welcome to do so. 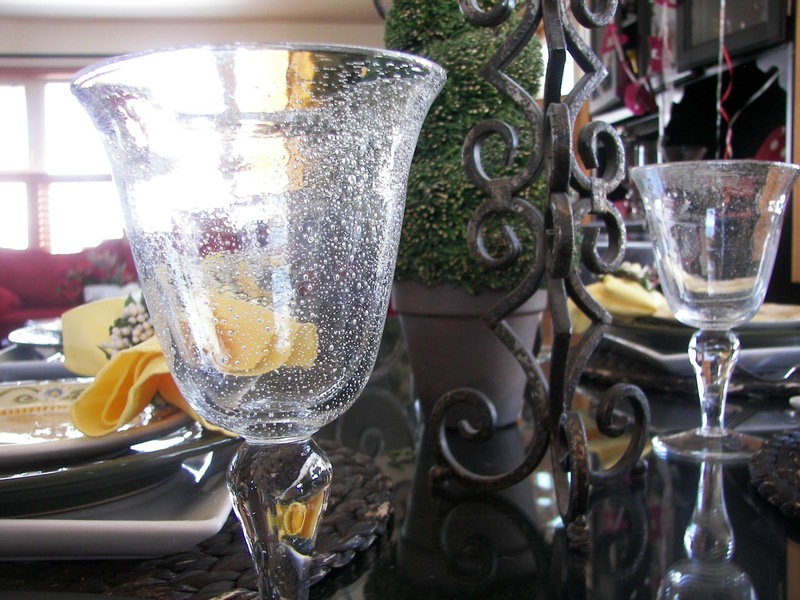 Your tablescape is so pretty. I can't even imagine how cold it is there, so I know you must have really enjoyed pretending "Spring" with all your lovelies. I've already bookmarked that wonderful cake for quick reference! The cake looks delicious too. Looks so pretty! I thought of doing a green table this week too. I am ready for spring. These nice warm days just trick you and then along comes the snow again!